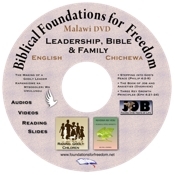 BFF's Malawi - Chichewa Training DVD for sale! Check out the 3 themes! Three special training lessons: Discipleship D1, Marriage and Bible. Tell your friends! Buy one for a friend, pastor or missionary! 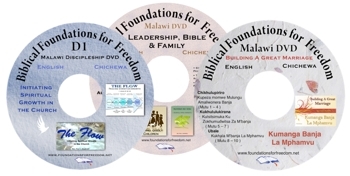 Each of the Chichewa library resources are packed full of great resources. More specific descriptions are below. Available bilingual videos, audios (mp3s) are included. 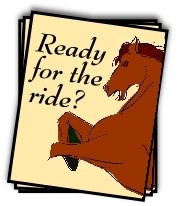 English books, handouts and powerpoints are also supplied along with Chichewa handouts. See description below. Please note that most of these materials are available online as our service for you. These Libraries are offered at discount price for those not having good online services or for gifts. Feel free to see whether you as a fulltime Christian worker qualify for free materials. After you receive the BFF Chichewa USB Flash Drive, we give you permission to edit the articles, powerpoints, etc. for your teaching. Copy the whole BFF USB drivefor others. No posting online. Put a copy in your church library. Your members can make a copy of the USB drive! We only ask that it is not done for profit. Isaiah 50: 4 (Part 1/2): The Heart of Discipleship: The Art of Following Jesus. Practical exposition on Isaiah 50:4 shows how to be like Jesus. The Flow: Overview: 1 John 2:12-14. An overview helping believers not only understand his own Christian life but how to help others grow. The Flow: Level #1 (1 John 2:12-14): Helping New Believers Grow by showing the basic needs of new believers and how to properly care for them. 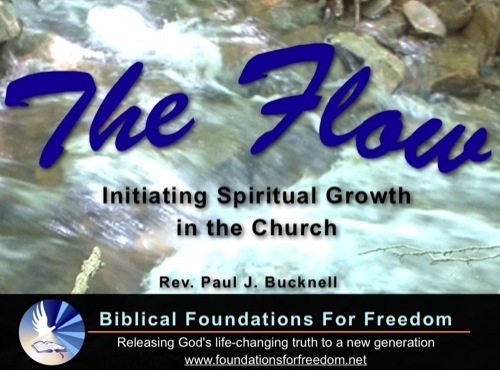 The Flow: Level #1: Implementing the Flow using discipleship material. Describes both how to disciple new believers using The Flow materials. The Heart of Discipleship: The Art of Following Jesus: Practical exposition on Isaiah 50:4-9 shows how to be like Jesus. The Flow: Level 2 The Overcomer: Helping Young believers Overcome Temptations. Helps Young believers Overcome. Increase the faith of the believers in your church. The Design of the Church - Ephesians 4:11-13 helps us rightly think and function in the church no matter how much our concepts have been distorted. Helping Young believers Overcome temptation. This video llustrates how discipleship functions at stage #2 of The Flow. Young believers can be strong and overcome any worry or temptation! The Flow Level #3 - Fathers - Establish Faith on 1 John 2:13-14, Developing Leaders in the Church - Fathers Stage #3 shows how God's design for all believers to deepen their intimacy with Him so they can join God in effectively serving others. This video on The Development of Prayer in a Believer's Life analyzes how prayer develops at various levels of Christian living through The Flow, including identifying what problems occur when prayer does not properly develop and how to strengthen our prayer lives at each level of spiritual growth. 2 Timothy 2:2 and Discipleship Training. The Plan of Discipleship provides practical advice on how one should disciple another and especially on how a leader of the church can implement discipleship training in the church. The Flow Training Manual shows how step by step to train a person to use The Flow to help any believer, young or old, to see where he or she is in his faith and help them be eager to grow and learn. 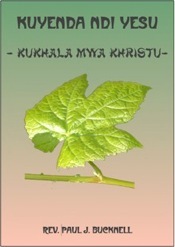 #4 Caring for the Young & Mature Believer - Kusamalira Okhulupirira Okhwima msinkhu. Bilingual audios, Chichewa handouts and English book, handouts and powerpoints.